I blushed… feeling like a weirdo… but after a second I saw that everyone got their heads back in their laptops so I grabbed a cup of coffee and waited till someone else shows up (at least I wasn’t late…). Actually, the story starts about a year ago, when I first decided to write an Android app, it was pretty cool: I downloaded and installed Android SDK and the required Eclipse plugin, skipped most of the tutorials and just “went for it”. A few months later I had my app and it was pretty cool, it was provided with song-names from a server that I ran on rackspace and buttons like: “watch on youtube”, “share on facebook” and “buy on amazon” and some other stuff. All the buttons just triggered REST-API calls to the server which implemented all the logic on the backend. It actually worked fine on the simulator and on my HTC Aria, but when tested on higher versions of Android it failed, and it took me a while to figure out why. I found out that from Gingerbread and on – only non-synchronized HTTP calls were supported. A few months ago, my wife came up with an idea for another app and I promised her that I’ll build it. Then I heard about Corona – so I decided to give it a fair chance. Alas, we started with the wrong foot: A very kind guy named Jerry Pierre helped me by instructing me to download and install Corona SDK first, and then Lua Glider (IDE). I’m a bit ashamed to admit, but the laptop I’m (rarely) using has Vista installed and since the computer is not mine – I can’t install Win7. At home, and at work, I use desktops, and in general – I prefer desktops (yes, I know it’s weird – but I don’t like laptops…). It seems that Lua work well on Win7 as well as on Mac, but on Vista it took me an hour of fighting until I gave up and opened Notepad++. So after a couple of hours, and a very nice walk-through I got from Mayank Malik – I decided to wrap it up, go back home, and use my desktop to continue “playing” with Corona. * Once you started using it – you’re tied to it, you won’t be able to migrate to another platform. Ever. – $199/year for the “indi” version – a license to publish in one of the two: iOS or Android. – $349 to get the “pro” version – the option to build your app in all the supported platforms. Now seriously, this price is good if you plan to monetize your apps, but when you just build things for fun, then it’s a bit pricey. If I was planning to develop a game that would use the fancy physics library – I might have chosen Corona, but since I don’t (and also since I don’t appreciate the “closed garden” policy) – I decided to pass. Back to our lunch at Silicon Valley CodeCamp. People were hoping to win the XBOX and I told them that I don’t care about the XBOX and that I wish they would throw in intelliJ licenses (one license worth $500). We finished our lunches and went to the main court where the raffle took place, and to my astonishment, the guy with the mic announced the list of prizes and among them, one intelliJ license. I was stunned. David laughed and said: “I’m going to win this one for you”. And believe it or not – he did! 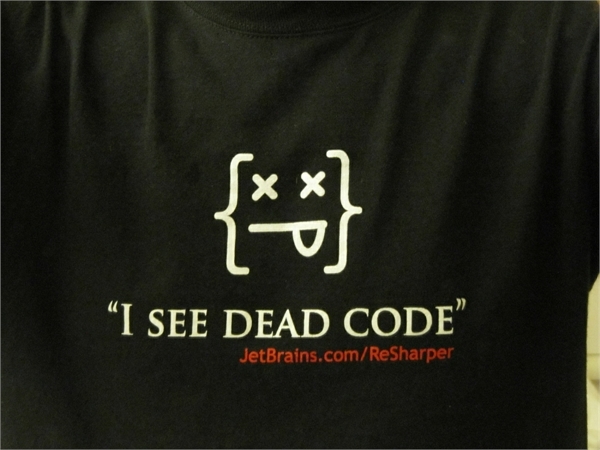 Jetbrains, the company that made intelliJ had a booth there in SVCC – so I got myself a shirt that says: “I see dead code”. And now I really do: among many other cool features, intelliJ finds unused parameters and colors them in grey. This simple feature is priceless (and I’m not familiar with any equivalent feature in Netbeans/Eclipse). 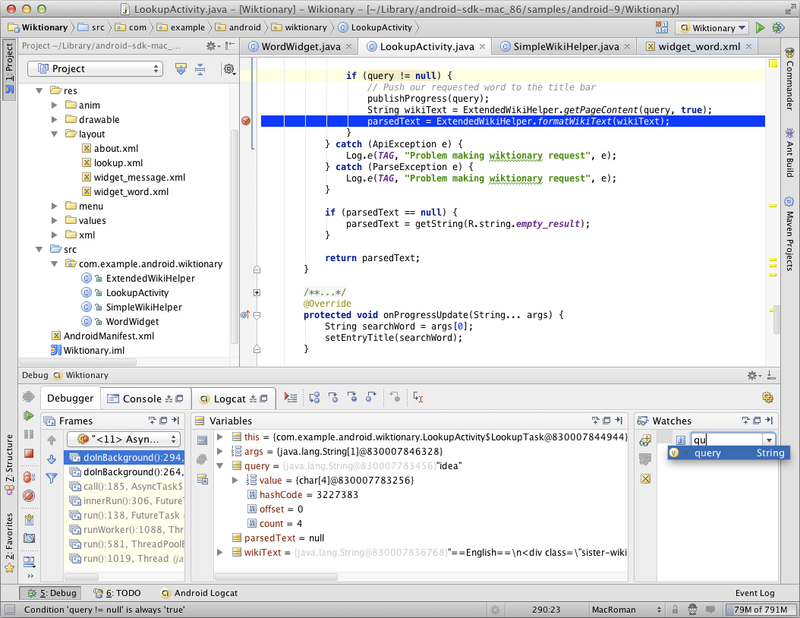 Without intelliJ it’s not easy to see it, but if you figured it out – way to go! and that this exception is caught six lines below – but the only thing that is being done is a “debug” printing to log (not even an error!) and then the method ALWAYS returns null and continues. How many bad practices do we see here – can you count ? 1. we don’t “fail-fast” (the method should have either thrown an error or at least print ERROR to log instead of DEBUG). 2. we throw and catch an exception (which is costly!) without really handling it. 4. I’m 100% sure that no unit-tests, functionality tests, regression, end-to-end or any kind of tests were written and used here – otherwise this bug would have been easily caught. So here’s a call to all you decision makers, think about the hours of debugging, fixing, reviewing the code-fix, QAing the fix and deploying – that could be saved, not to mention potential damage that could be done to your company and your clients. Always consider purchasing the best tools you can for your engineers. It might look like an “expensive investment” but it’ll pay off, trust me (and if you can’t trust me, you should believe Joel. Check-out item #9 on his list).